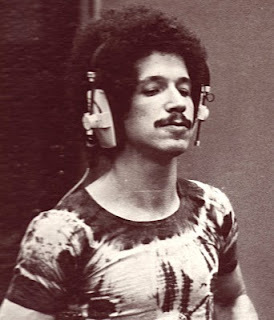 Preparing for my immersion in Keith Jarrett's so-called American Quartet I realize that I am missing two pieces of their official catalogue: their first release, The Mourning Of A Star, which was recorded in July 1971, along with El Juicio and Birth; and The Survivors' Suite, the band's first of two recordings on ECM. I have to remedy that. I've been pondering how to launch this study—thinking I might begin with Expectations, which, although it was recorded three months after the quartet first recorded, always feels like an introduction to me, because it features other musicians. "When you have two guys from Ornette Coleman's band, which never had a piano, and their leader is now a pianist, it's a very touchy situation. Because when you hear music melodically the way most of the Ornette players—including Ornette—hear, they are not trapped; they will never allow themselves to be inside a zone if they feel like leaving that zone. So if you're writing something to make a unit out of this quartet, it's like writing a thing that's a bubble that can continue to expand in different directions and doesn't inhibit everybody. But still, you don't want one guy to play one way, and another guy to play on changes. You don't want the bubble that holds them together to burst. The challenge was immense, but it was a very interesting band." Erratum: Pianist Frank Kimbrough kindly pointed out to me that The Mourning Of A Star is, in fact, a trio recording without Dewey Redman. My error resulted from my poor reading of the credits in Richard Cook and Brian Morton's Penguin Guide To Jazz. So, I'm only missing one, and I have a line on that now, too. Onwards! Where else but New York City can you feel so completely immersed in music talk and actual listening that you can imagine yourself in a world where music is the lingua franca and larger problems simply disappear? Uptown, where Paul Blair led an historical walking tour of Harlem; Midtown, where the Association of Performing Arts Presenters delegates took over two large hotels; and Downtown, where the Winter JazzFest filled five West Village clubs to capacity (and beyond, onto the frigid sidewalks)—Manhattan felt like it was buzzing, despite weather that was almost too much like home for me. One of the more jaded of the compatriots I spent three afternoons discussing jazz business with thought that the APAP confab was like a scaled-down version of the late, lamented International Association of Jazz Education conference—which used to take place at the same two Midtown hotels—but the scale seemed just right to me. On a purely selfish level, it meant you could get a table at the Hilton's bar to chow down on amazing street food and chew the fat about the fortunes of jazz. On another level, it meant that the discussion within the conference went beyond jazz to other branches of art, allowing dance presenters to trade notes and experiences with new music promoters. Within our own group, it meant—for one of the first times I can remember—young bucks like National Public Radio's Patrick Jarenwattananon and relative gray beards like Gary Giddins exchanged ideas. The most-productive of the Jazz Journalists Association's three session I participated in was the setting for energetic discussions between writers, Webcasters, publicists, label owners like Pi's Yulun Wang and musicians like bassist Melvin Gibbs. Invigorating stuff! 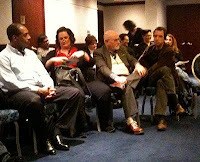 As JJA president Howard Mandel and I pondered at the end of a small cocktail party: How do we keep this dialogue flowing? If we can do that, I don't think it's an exaggeration to say that we may be on the verge of a rejuvenation of the jazz journalism business that might be on the level of what happened in the 1960s, when magazines like Rolling Stone changed the face of music journalism. No one has any doubt that there is no shortage of vital music to report on. Numerous artists who participated in the two-night Winter JazzFest marveled from the stage about the great music going on and the terrific vibe among the large audiences. My full report on Winter JazzFest will be in a future issue of DownBeat. Once the festival season ends, it's a lonely life for those of us in the jazz industry outside New York City. Time was—as uninviting as winter air travel is—when early January offered a nice off-season opportunity to get together, at the annual International Association of Jazz Education conference. But IAJE lost its way, got a little greedy for true international reach, and went bankrupt. Suddenly, January seemed a lot longer and colder. Fortunately, jazz workers, like nature itself, abhor a vacuum, so we found a new reason to get together in the weeks after Christmas. The Association of Performing Arts Presenters has been around for more than 40 years, and represents members in some 15 countries, in addition to all 50 states in the U.S. The organization is reaching out to the jazz community this year, tying its annual conference into the National Endowment for the Arts' Jazz Masters celebration and staging some jazz-centric programming of its own. What's more, the APAP conference also coincides with Winter Jazzfest, which fills a handful of West Village clubs with some of the most interesting young musicians in jazz for two nights. This year's lineup is exceptional, featuring the kinds of one-off combinations you only get to hear in New York, as well as great touring bands like Vijay Iyer's trio. The Jazz Journalists Association lost one of its main focal points when the IAJE went under, and we hate a vacuum more than anyone. Fortunately, APAP has reached out to the JJA this year, too, and the organization will be staging several events in and around the conference. On Saturday, from 2-4 p.m., I'll be moderating a town hall-style session on the business of jazz journalism. The session is free and will be held at the Sheraton Hotel, 811 Seventh Avenue, Conference Center Room E, on the hotel's ground floor just to the left inside the Seventh Avenue entrance. If you have a couple of free hours and you're in the neighborhood, drop by and find out a bit more about the state of jazz criticism in the digital era. I blogged way less about Cecil Taylor than I had intended to in 2009, as I worked my way through a couple of dozen of his recordings from 1956 to 2006, but what is New Year's about if not re-birth and resolution? With that in mind, I'm embarking on the third annual Library Listening Project today, and focusing on Keith Jarrett's so-called American Quartet: Dewey Redman, Charlie Haden and Paul Motian. Unlike most of the iconic bands/artists who have enough far-distant back catalogue to warrant one of these year-long sessions, Jarrett's quartet is actually a band I saw live—in the winter of 1975-76 at Ottawa's National Arts Centre—and followed contemporaneously. I think I probably heard them for the first time on one of the weeknightly jazz programs that CBC Radio used to broadcast. At 20, I was aware of Haden, of course, and knew Motian had been in Bill Evans' landmark trio, although Evans was not someone I had checked out beyond his time with Miles Davis. I had read about Redman's contributions to the early '70s Ornette Coleman group, and was anxious to hear him. I had few jazz pals in Ottawa at the time, so I went to see the quartet alone (I couldn't even imagine knowing a girl who'd be interested in doing that as a date at the time!) and it was a revelation. Being immersed in the fusion era, Motian's tiny drum kit (to say nothing of what he did with it) seemed revolutionary, and Redman's sound was huge. Jarrett and Haden lived up to my expectations, which were high. Fort Yawuh became one of my go-to albums, with "De Drums" high on my list of favourite live tracks of all time. It has been interesting to read Jarrett's recent comments about how dysfunctional that quartet was: with Haden still addicted to opiates; and Redman a heavy drinker, chronically late and unable to read music. I'm not sure that knowledge will put this music in a different light; probably not. What does cast a brighter, if not different, light is realizing how many other people this band touched—from Ethan Iverson, who conducted one of those recent interviews with Jarrett, to drummer George Schuller, who recently released a very good tribute to the American Quartet. Watch for my reflections on the band throughout the coming year.